The city has shaken off the heat wave by the time the vigil for June takes place at the Visitation of the Blessed Virgin Mary a week after Val’s rescue. It’s a Sunday and the congregation has decided to devote their traditional service to June. Across the street from the park, the people from the Houses are holding their summer reunion— a daylong festival of music and barbecue. Coffey Park is buzzing— every square of grass claimed by a different family. Old-school hip-hop is being pumped from two stacks of speakers. Girls in short denim shorts with rhinestone accents and bright tank tops travel as a team, dancing in time to the music as they check out the offerings on the various grills. Before Val can absorb any of the excitement, her mother ushers her into the church. The heavy door slams behind her and the party is shut out. observations: One reviewer claims this book is an urban opera: there doesn’t seem to be any movement to recognize this genre yet, but it’s a brilliant description. 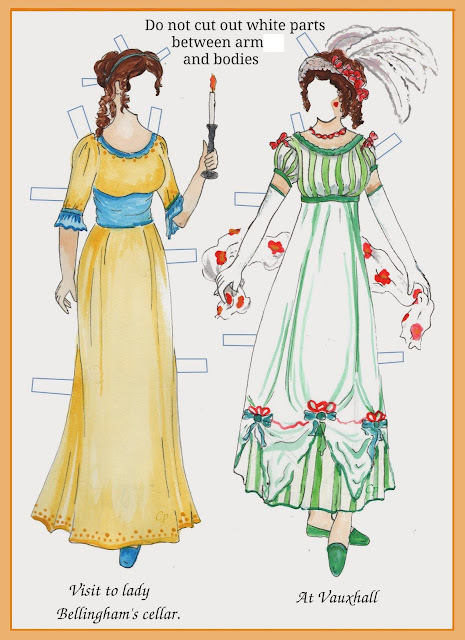 The book starts with two young women, Val and June, in a run-down part of Brooklyn. It’s a hot night at the end of the summer, and they go off in search of adventure and take a pink raft out on the water. Only one of the girls comes back from the expedition, and the book follows the lives of local residents over the next few months: the girl who survived, another young woman who knew them both, a music teacher, a young man who was around that night, a Lebanese storekeeper, all their families. I found it entrancing, and impossibly real: I feel I would recognize the street and its residents if I were dropped down there. The young women’s restlessness and impatience with the world ‘watching the summer escape’, just at the point where boys are starting to be a real consideration, but not quite there. The area – Red Hook – is going to start receiving cruise ships shortly: is this going to change the future? The bulletproof Chinese where they get takeaway, the bodega with its community newsletter. When I first read the section of the book above, I thought the ‘rhinestone accents’ were the way the girls spoke, and I spent some time trying to work out what a rhinestone accent would sound like. 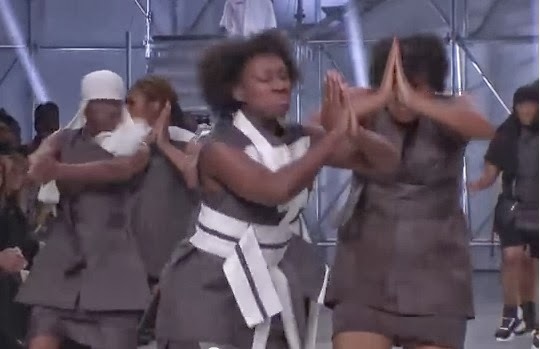 The photos show young women doing stepping – a team-based dance and drill activity very popular particularly among African-Americans in the USA. 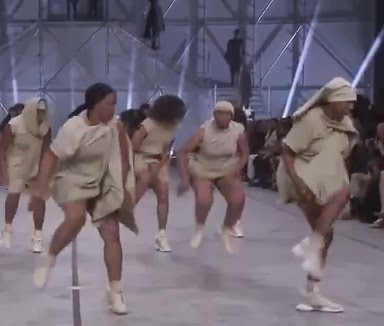 The pictures are screengrabs from an amazing fashion show: designer Rick Owens asked step teams, rather than supermodels, to show off his new clothes, with incredible results you can see in a YouTube video here. It's already on the pile this one.........might not see the light of day for a few years yet though! Moira - Oh, I am so keen to read this one! I'm very glad you offered your perspective as I'm even more eager now. 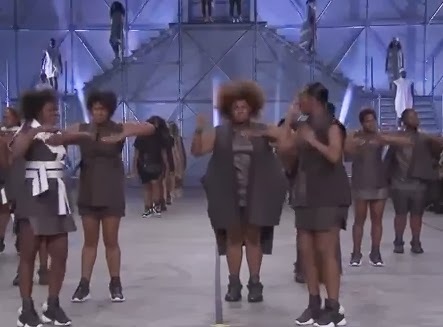 And I love the idea of using a step team to model clothes. How refreshing. I've seen step teams at work and they can be incredible. Yes, I was enchanted by the fashion show idea, good for him, and good for the young women. And I found the book spell-binding, I hope you do too. Just finished this book. Loved it. It's more about human relations and friendships than anything else, and how people from varied cultures and communities work things out; it is full of solidarity.. It is a book full of hope and it's optimistic. One can find the author's email at her website. I wrote and thanked her for the book. She responded immediately. Hope another book is in the pipeline. I have this one and hope to read it soon. I have heard so much good about it, I hope I like it as well. The stepping sounds interesting. I hope so too! I looked up stepping online, and it was a fascinating topic.